Appears very sturdy despite having many pieces. We are still waiting on the little ones but I think this will suit the need well. It took a little while to assemble because of the number of components but the result is very satisfactory for the price. The bins are a nice touch. To make it 5 stars I would have liked the top rails to not have a gap showing exposed screws as well as caps for the exposed screw heads. It has a good white finish but then a couple of silver caps that show up. Badger Basket's Modern Baby Changing Table with Hamper and Three Baskets is a practical and stylish place for diaper changing and getting baby ready for the day. Includes a large hamper and three baskets. Hamper is fully removable leaving you a convenient spot in the changing table for your diaper pail. Includes a changing pad and safety belt, too. 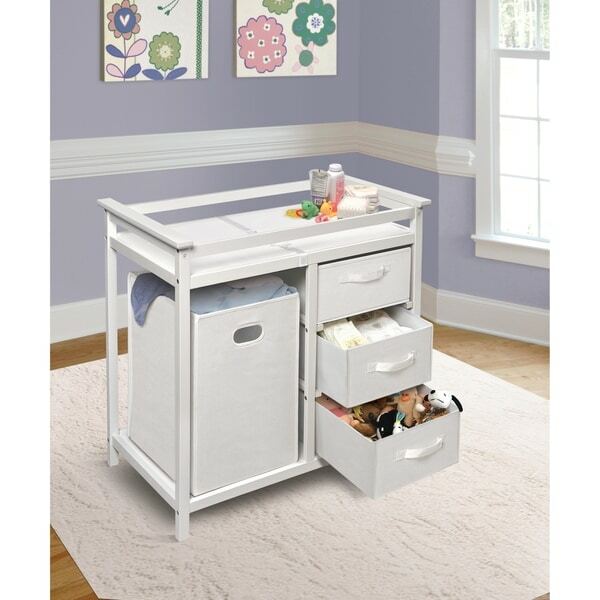 When Baby outgrows this table, it becomes a useful piece of furniture for organizing toys and more. Safety rails enclose all four sides around the top of the table. Metal support bar beneath the changing surface provides additional stability. Hamper and baskets fold for storage. Changing Table frame made with multi-layer solid wood, and the shelves are engineered wood with veneer. All paints and finishes are non-toxic. Outside fabric on the baskets is 80% Polyester/20% Cotton. Inside lining on the baskets (including the bottom panel) is non-woven fabric. Changing pad is polyurethane foam covered with wipe clean PEVA (non-PVC) vinyl. Overall unit measures 34.25 inches W x 20.75 inches D x 34.5 inches H. Hamper measures 13.5 inches L x 13.75 inches D x 21.5 inches H. Baskets measure 14.25 inches L x 17 inches W x 7 inches H. Changing pad measures 31.5 inches L x 17.5 inches W x 1 inch H. All measurements approximate. Wipe and spot clean as needed. Basket color depends on color of the table (baskets are either White or Ecru). Changing table is for use with children weighing up to 30 lbs. (13.6 kg). Adult assembly required. Illustrated assembly instructions included. Meets all currently applicable testing standards. Product includes a limited warranty of 30 Days Parts to the original purchaser. Product may vary slightly from shown and described. Props/accessories shown are for illustration purposes only and are not included with the product. Actual color/finish may vary slightly from screen display. This item ships in its original carton that may include a product photo. Dimensions 34.25 In. X 20.75 In. X 34.5 In. A gift to my daughter for my grandson and I love it too! Sturdy, fashionable, durable and extremely useful especially with the easy pull-out cloth drawers. And baby is safe with the wooden bars around (but of course, NEVER leave your baby unattended no matter how old they are). I bought the LA Baby 30-inch Cocoon Changing Pad to go with this Changing Table and it fits perfectly. It's stylish and easy to move and lift if need be. Only thing is that the color is a bit on the reddish side (Cherry) which is okay because the color still is great. I highly recommend this product. You will love it too! We are impressed with this product. It was a great look at a great price and had storage and hamper included? yes please! I just figured it may be a bit wobbly due to the minimal structure to it and the price point as well. I was pleasantly surprised... it is very sturdy! The wood is smooth and heavier than you'd think. The quality is nicer than a lot of the furniture you find out there these days. It's NOT composite and laminate like what is common to find in assemble-yourself furniture. It is a perfect height and we'll get much use from it. Only thing I would say is don't count on using that thin pad that comes with it. Your standard contour changing pad will fit snuggly in the top and be much cushier than the one it comes with. I received the changing table yesterday... My husband wasn't home yet, but I figured I'd open up the box and see how hard it was going to be to put together. I had the table up and ready for use within an hour, which I think is great considering I'm 36 weeks pregnant! The directions were easy, the wood was great (no marks). I would recommend this product to anyone. The storage bins give you lots of room. Great buy! The picture doesn't give this product justice! This product looks wonderful!! After using it for a changing table, we will definitely use the table for something else later either in the boy's room or master suite! It doesn't scream "This is a changing table!!" It is rather classy and can easily be used for furniture once the baby outgrows it. This wasn't difficult to put together. My husband was able to assemble quickly. I love the bamboo colored drawers with the cherry wood. Don't forget to buy pad covers for the changing pad. My daughter requested this changing table -- Being my first grandchild I was willing to buy a much fancier style but when I saw it and actually changed a baby on it -- I can see why she wanted this one! This was exactly what I expected. We needed a changing table that was higher than the pack n play changing table attachment b/c we were killing our back. This table is great, perfect height. I only had a small issue with assembly getting baskets on the correct side. The quality of the material is excellent. I am very happy with this product. The quality is not very impressive but considering we will need it only for the initial years of the baby, I think it will do. The color matches perfectly to photos here and to the crib we have. The instructions were good though not all pieces were marked. We did have a few glitches assembling as the places where the bolts were supposed to go were not drilled properly. The baskets and drawers don't look like they can take rough handling and yeah the changing pad is very very thin, I will have to buy a new thicker padded one. All in all an ok buy! I've been using this table for over 7 years and it's still going strong. It has survived three moves across the country while fully assembled with only a small piece breaking off the top of one of the rails. The basket drawers are still in pristine shape, while the cardboard-like material inside the laundry hamper only has one small bend in it near one of the handles. I would absolutely buy this table again, but this one seems like it will last forever! Easy to assemble. I did it myself while I was pregnant and it was durable. I bought it to match his safari theme nursery and it was perfect. Love it. Love the drawers for hiding diapers, clothes, blankets as well as keeping them neat. Wanted the railing for safety. Made of wood, not plastic which made a difference to me. very happy with my purchase. Very nice changing table. Loved the hamper and extra storage space. Worked great until baby got to big, but my kid is unusually tall. Would definitely recommend. Was a gift and they enjoyed it. The quality is great. Very sturdy and perfect size. When looking for the right one a friend of ours had one just like this. Once I saw the sturdiness and size I was convinced this was the one we needed. I am completely satisfied with our changing table and show it to everyone. We have been using this for close to a year and it has held up quite well with both baby and our cats weight and climbing around on it. Its only flaw seems to be the thin wood made it a bit more difficult on assembly. This changing table , now 5 1/2 years old, is on it’s second child, now 18 months old. It has held up nicely to the vigorous antics of 2 children with rocking and climbing. The parents love the hamper space and drawers for easy access to items. I would recommend this to anyone. "what are the dimensions of the changing pad?" Price & looks decent for daily use. "is the weight limit on all changing tables 30lbs?" This table has that limit.